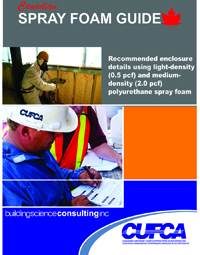 This guide was produced by CUFCA in order to clarify the correct usage of both two pound closed cell and half pound open cell spray foam products. This document is available at no charge from CUFCA. It is an excellent companion document for all Building Officials in order to determine correct application of each product in all climatic regions across Canada. CUFCA has enjoyed a longstanding productive relationship with both the University of Waterloo and the Building Science Consulting Group Inc. CUFCA, as a 30 year old not-for-profit Industry Association, continues to work with all stakeholder to provide clarity to a sometimes confusing marketplace of spray foam. CUFCA works with leading Manufacturers and Contractors to administer a best in class site quality assurance program in addition to our Industry recognized training and licensing program. For more information on CUFCA please contact us at cufca@cufca.ca.